Superbodies, which looks at how human bodies work and how technology can keep us healthy. Up in the Air, which takes readers on a journey from land to sky. Illusion, where the idea of perception is explored, and how some things are not always as they seem. In How it’s Made, which looks at how new technologies are changing how things are made. 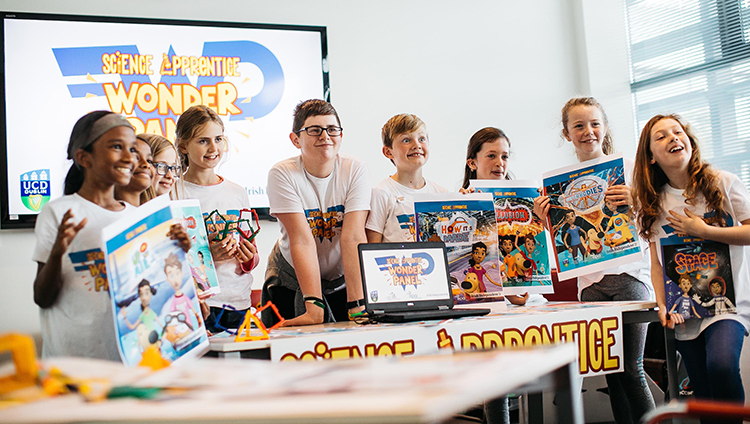 Irish school children have helped created a new book series aimed at encouraging a new generation of budding scientists. The Science Apprentice series returns this month; offering readers of all ages the chance to delve into the world of science, technology, engineering and mathematics. Free to collect with the Irish Independent in SuperValu stores every Saturday in November, the 2018 versions of the fun and educational books features augmented reality technology. Throughout the books, Irish experts are on hand to explain concepts and answer questions as readers uncover some of the big ideas that are changing modern Ireland. Written by science journalist and writer Dr Claire O’Connell, the books are aimed at opening children’s minds to potential careers in science, technology, engineering and mathematics. Involved at every stage was a group of primary school age advisors, who worked with the Science Apprentice team to form questions and answers relative to Irish schoolchildren. Superbodies, which looks at how human bodies work, including hidden systems such as nerves, muscles and hormones. It also details out how technology can help to keep things on track in conditions such as Type 1 diabetes. Up in the Air, which takes readers on a journey from land to sky, and speaks to them about issues such as pollution, flight, weather and ecology. And In How it’s Made, which looks at how building houses has changed over the time, and how technologies such as 3D-printing is opening up new ways to make things. The books are produced by the Public Engagement Team at UCD Research along with academics from UCD School of Education and UCD Computer Science and supported by the Science Foundation Ireland Discover Programme and the Environmental Protection Agency.